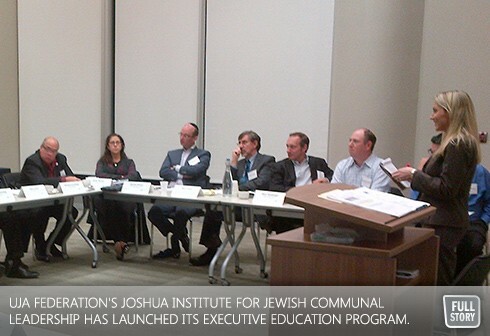 This past Thursday evening saw the launch of this year's Joshua Institute for Jewish Communal Leadership Executive Education Program. Established in 2009, this year's group is the fifth cohort of participants in the program. Over 22 individuals representing a cross section of 11 community agencies, organizations, schools and synagogues are participating this year. The program, which focuses on Jewish values and leadership, was facilitated by Rabbi Lauren Berkun, Director of Rabbinic and Synagogue Programs for the Shalom Hartman Institute of North America. This is the first year that professionals in the community have been invited into the program to participate alongside their incoming board chairs or executive committee members. Janis Roth, Executive Director of JIAS Toronto, participating with her lay chair Steven Garmaise said of the launch: "It set a powerful framework for the group's learning; moving us - with text and insight -from "leaders" by virtue of our positions, to thinking about the responsibilities that come with (and are earned) of a Jewish leader." The Joshua Institute for Jewish Communal Leadership, directed by Robin Gofine and Chaired by Daniel Rethazy, represents UJA Federation's investment in community leadership and is founded upon the belief that strong leaders and organizations are the backbone of community. The purpose of the program is to expose participants to top-notch experts in the field of best practice in the not for profit sector, and to create a supportive peer network of lay leaders and professional leaders that support and form the basis of future collaborative endeavors. In addition to Jewish values and leadership, this year's themes will include building a high performance organization, board governance, leading change, the lay professional dynamic and the Israel-Diaspora relationship. There will also be a one-day intensive collaboration workshop. Faculty are drawn our local lay and professional leadership, the Shalom Hartman Institute of North America, McKinsey & Company and the Rotman School of Management.